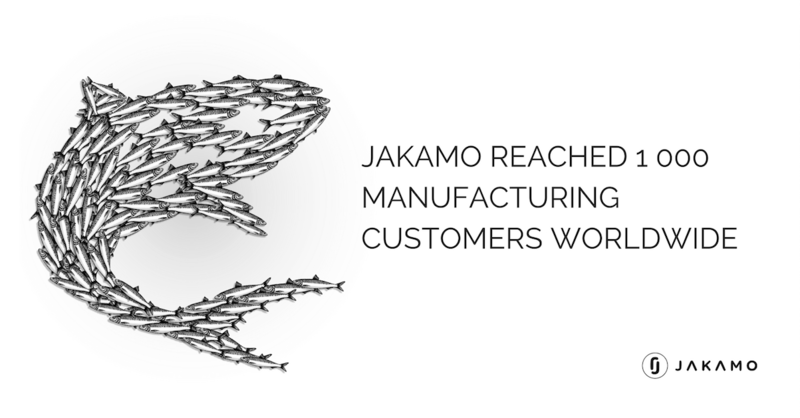 Today, we at Jakamo are happy to announce that we have reached a customer base of over 1000 manufacturing companies around the world. This is a big milestone for us! Instead of celebrating us, it’s an outstanding moment to celebrate our customers! Jakamo users benefit from information visibility and availability, that leads towards higher performance in white-collar productivity. We will continue our work together with our customers to reach our ultimate goal – finding the perfect way for manufacturing companies to collaborate. Growth in customer base has sped up especially in the manufacturing sector. The quick implementation process for new customer is one of the corner stones of the outstanding user experience – Jakamo can be adopted in minutes. Customers have varying requirements for information sharing. Usually the collaboration is related to management of Purchase Orders, Claims, Engineering Change Requests or Audits. We have a lot new releases coming soon, and we look forward to being able to share all of our stunning developments. In 2016, Jakamo will launch a whole new concept for cross-company communication. It will further strengthen the existing concept of information sharing and collaboration between companies. Jakamo service is designed for manufacturing companies. In Jakamo platform, companies connect with each other and share information such as orders, ideas, claims and projects. Jakamo serves over 1000 businesses, large and small, in about 40 countries around the world. In Jakamo, information sharing is fast, easy and secure. It can be implemented quickly and integrated with internal systems such as ERPs and PLMs. Unlike traditional systems, Jakamo makes the shared information available in real-time for both customer’s and supplier’s employees. The service is free to use for any company with enterprise subscriptions available for advanced users.